This entry was posted on Tuesday, April 9th, 2019 at 8:08 am. Back row l-r: Robert Brown – Friends of Westbury Station, James Wilcox – GWR, Byrony Chetwode – TravelWatch SouthWest, Dan Okey – GWR, Ian Awcock – Awcock Ward Partnership, Simon Gledhill – GWR, Tom Vaughan-Jones – Square Bay, Stephen Shaw from Alium Group. Front row l-r: Rosemary Buchan – Friends of Westbury Station, Matthew Golton – GWR, Cllr Horace Prickett – Wiltshire Council, Paul Johnson – TransWilts Community Rail Partnership, Andrew Payne – Allium Group. Great Western Railway has responded to calls for improved parking at Westbury Station by increasing the number of spaces by 150. More than half a million journeys are made to and from Westbury Station every year, and with the introduction of GWR’s bigger and faster Intercity Express Trains the company expects that to increase even further in coming years. 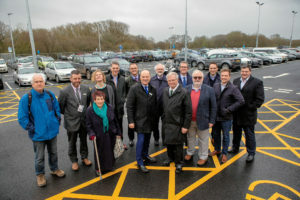 GWR has worked with Wiltshire Council and developers Square Bay to develop the car park and bring the total number of spaces at the station to 420. Work began on the site in September 2018 and was completed in March. The station was officially opened by Horace Prickett, portfolio holder for transport at Wiltshire Council. He said, “The new extended car park at Westbury Station will be a great asset to rail travellers. The current car park has been overfull for some time and a source of anguish to regular traveller. “I am pleased that Great Western Railway have listened to its customers and reacted in a swift and timely manner, completing the work very quickly. It is testament to the staff at GWR and their ability to listen to the needs of their customers. Great Western Railway’s commercial development director Matthew Golton said, “These additional spaces are so important for the local community as the brand new Intercity Express Trains that are now replacing our 40-year-old HSTs, encourage more people to switch to rail.